I’ve been a Deep Purple fan for as long as I’ve loved rock. Fireball was among the first LPs I ever purchased and played on my parents’ crappy rec-room stereo from the ’50s. Even today, when “Highway Star” comes on the car radio, I’ll crank it up and forget about photo radar for a while. I adored the band during its Machine Head heyday; I loved it when singer Ian Gillan and bassist Roger Glover quit and were replaced by David Coverdale and Glenn Hughes; I even held it in high esteem when Ritchie Blackmore left in a huff and Tommy Bolin temporarily took over on guitar. There’s always been something that attracted me to the British hard-rock pioneers, and whatever that is is prominently featured in this four-disc retrospective. Shades rightfully focuses on the band’s chart-topping output between 1970 and ’72, but it also goes back as far as the late ’60s and forward to the present day, with Steve Morse from the Dixie Dregs handling guitar. As well as all the big hits, Shades’ 62 tracks include rare demos, studio outtakes, single versions, and live performances from hard-to-find import albums. 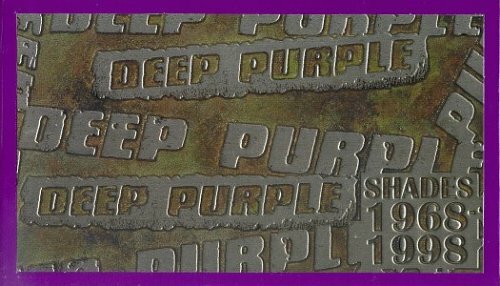 Even if you’re one of those alternative-only geeks who could never stand Deep Purple, you’ll still appreciate the layout of this set, which includes a nifty faux-metal cover. Rock on, dudes! I was a little ticked to buy this and only get two songs I didn’t before — No No No live, and the JLT B-side.